The new system includes an assortment of cameras and radar units, as well as six Velodyne LIDAR sensors, all housed in white plastic. 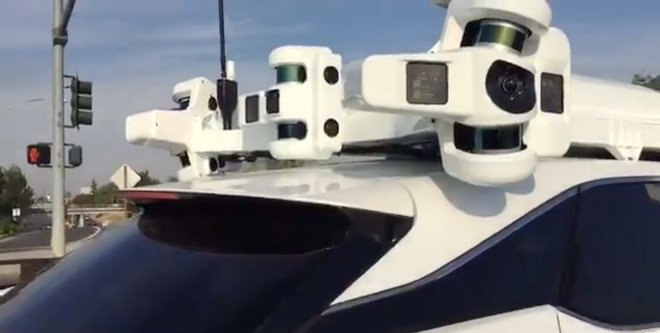 The 10-second video was shot by MacCallister Higgins, the co-founder of a self-driving startup called Voyage. Another Twitter poster said he snapped a photo of the same hardware "a few weeks ago" when a car pulled up to an Apple shuttle stop, waited, then continued on. Speaking with The Verge, Higgins speculated that Apple's computing hardware is likely situated on the roof of the cars —unlike other companies' self-driving vehicles, which normally move that equipment into the trunk. Apple has been largely quiet on its self-driving efforts, apart from confirming that it is doing research and development. Its hand was likely tipped by the need to drive on public roads. The company's long-term goal is thought to be the ridehailing market, likely in partnership with other firms rather than anything operated by itself. In the meantime it's said to be developing a "PAIL" (Palo Alto to Infinite Loop) shuttle for its workers, which might explain the behavior of test vehicles.